Containment Protocols: RPC-025 is to be secured in a locked room at all times. Room access requires the supervision of staff with Level 3 clearance or higher. Every 103 hours and 20 minutes (4 days, 7 hours and 20 minutes) a class D personnel hereafter referred to as "tribute" will enter the room while handcuffed and accompanied by one member of security wearing a hazmat suit. The tribute cannot have been previously selected as tribute and if possible should be someone who knows as little as possible regarding the identities of staff assigned to RPC-025. The security staff will place RPC-025 on the tribute and ensure that it does not become damaged in the process. After having worn the RPC the tribute and room are assessed for any potential danger before the tribute is retrieved from the room. If the tribute is still alive they will be examined to determine what effects the exposure had on them. Description: RPC-025 is a pair of full-rim metal eyeglasses. The frame is made of polished steel. The temple-tips are black in color and made of plastic. 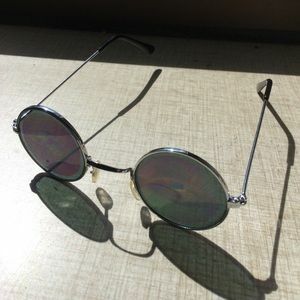 The lenses are primarily glass but also contain an unidentified substance and are tinted dark. When RPC-025 is worn by a human it will alter their eyes or eyesight in some way, these alterations are potentially dangerous to the wearer as well as to people in the vicinity. If RPC-025 goes for approximately 103 hours and 37 minutes without being worn it will cause someone in the vicinity to have their eyes turn into molten lead, so far this has always resulted in death. Test have been done on isolating RPC-025 up to a 3km radius but no range for this ability has been established, other than it tends to effect those nearest to it. If someone who has already worn RPC-025 wears it again there will be no effect and the time will not reset. If damaged the item will restore itself over time however it will be unable to accept tributes until restored. •Blindness - Total loss of eyesight is the most common effect occurring in 18% of cases. •Crying Fluorosulfuric acid - As the cost of long term hospitalization caused by this is too high, class D personnel showing this effect will be terminated. •A time delay on visual perception - The subjects see what their eyes were exposed to in the past instead of immediately. The most extreme case being a 7 minute delay. •Up to 7 additional pairs of eyes growing in the eye sockets - Noted to be extremely painful as the lack of space for the new eyes puts pressure on the interior of the skull. The new eyes will regrow if surgically removed. •Case #23 - The subject perceives all human skin as transparent. •Case #38 - The subject perceives all vision from the point of view of another person, later confirmed to be a woman living in Strasbourg France. •Cases #46 #73 #136 - A swarm of an unidentified species of insect burst from the subject's eyes. In case #46 stings from the insects caused the death of 2 personnel and the injury of 5 others, resulting in an increase in security and containment procedures. •Case #61 - The subject perceives vision from a stationary point in what he describes as a red desert. The inability to halt his vision by closing his eyes has reportedly caused him extreme distress. •Case #65 - The subject's eyes disappeared. •Case #79 - The subject perceives iron and alloys containing iron as glowing bright white. •Cases #81 #131 #173 - The subject's eyes burst releasing a high dosage of chlorine gas into the air. •Case #91 - The subject claimed he could see people's sins. He was able to identify those with a criminal past on sight with a very high but not perfect degree of accuracy. •Cases #103 #163 - The subjects perceive tall deformed humanoid figures walking through the facility observing people. When brought together it was confirmed both subjects saw figures doing the same actions in the same places. •Case #117 - Glass fragments blasted through the subject's skull with extreme force, resulting in the death of one security personnel. Autopsy of the subject suggests that both his eyes turned into glass before the left eye exploded. •Case #129 - The subject began screaming and when later unrestrained pulled his eyes out with his finger nails. The subject later committed suicide. Autopsies showed no medical abnormalities. •Case #143 - The subject felt agonizing pain at the sight of the color yellow. •Case #145 - The subject claimed to see strange animals eating everyone including himself. The subject described the walls and floors as coated in gore and people as walking corpses. The subject later died of a heart attack. •Case #159 - The subject became disoriented and died. Autopsy showed the cause of death to be mercury poisoning, and suggest that the subject's eyes filled with mercury which spread into the bloodstream. Addendum: Early cases of people's eyes turning to molten lead due to a tribute not being offered to RPC-025 appeared to be semi-random and primarily targeted by proximity. Later instances all affected staff who were directly in charge of RPC-025. This led Dr. L. Friedman to hypothesize that the object was sentient, aware it was being contained and able to target specific people at when not offered a tribute. Seeing as RPC-025's only contact with anyone on site are the tributes and supervising security it was hypothesized that it may be gaining knowledge from the tributes in some way. As a test the tribute in case #███ was convinced that another class D personnel referred to as Mr.X was the staff member in charge of overseeing the study of RPC-025. In the next 103 hours 37 minute cycle no tribute was offered and the person targeted was Mr.X. From here on all tests involving withholding tributes are forbidden and Class D personnel selected as tributes will have as little knowledge regarding site staff as possible.